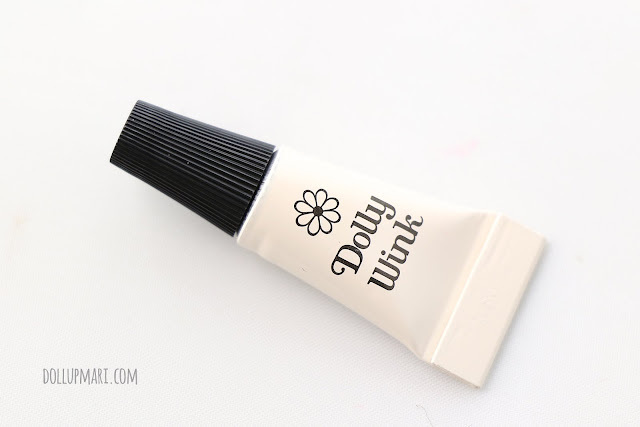 And I'm back with a Dolly Wink review! I know I've been showering the blog a lot with skincare and event posts that I felt that it was high time to put makeup posts again. 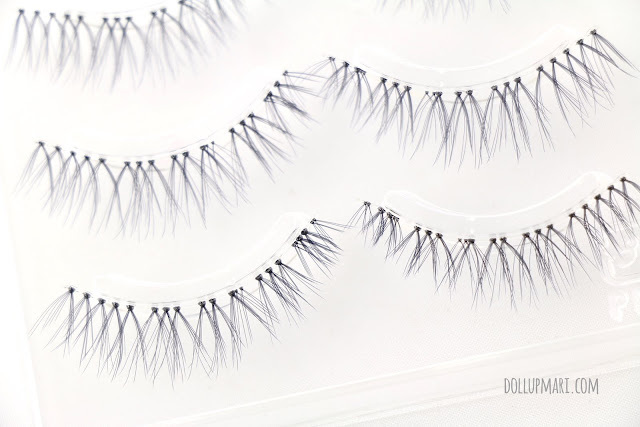 Today's review is about one of my all time favorite false eyelashes, Dolly Wink's Natural Dolly lashes. I know a lot of people are deterred from purchasing Dolly Wink lashes, especially if they do not know the brand, because of the price. But I'm glad to say that it's one of those things that cost a lot but last the user a long time. I also got away with this pack because instead of the usual two pairs, this pack has three pairs. 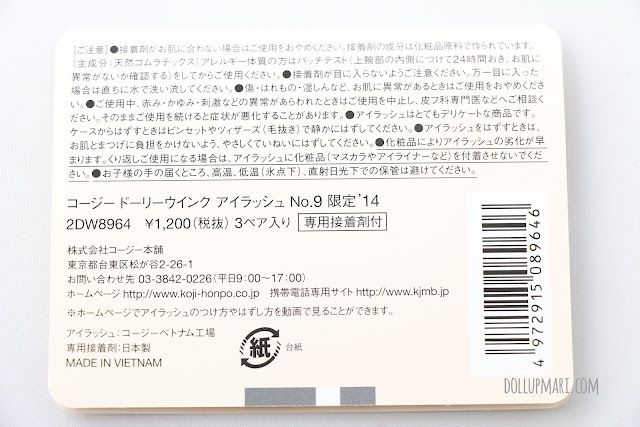 This is the package of the product, and the image is the illustration as to how the lashes would look when applied. Dolly Wink has a very, very broad range of lashes that can really change the way one looks, which is why it is super important to have these photos. The package says "Any girl can become a doll!" 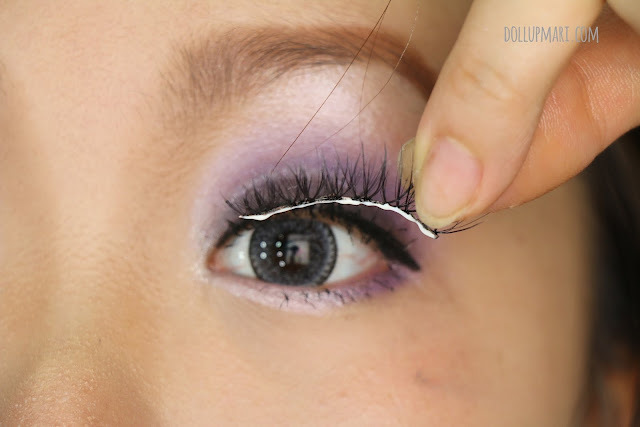 -- for those doll like patch type eyelashes, this is for you! 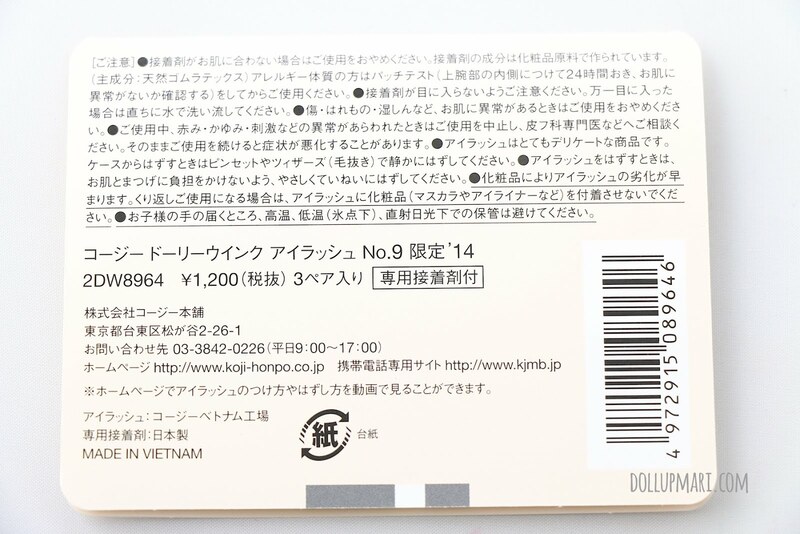 This is the label on the back. As shown by the price tag, I got this for HKD84 (Php504) at the time. And at least these lashes are not made in China, they're made in Vietnam. 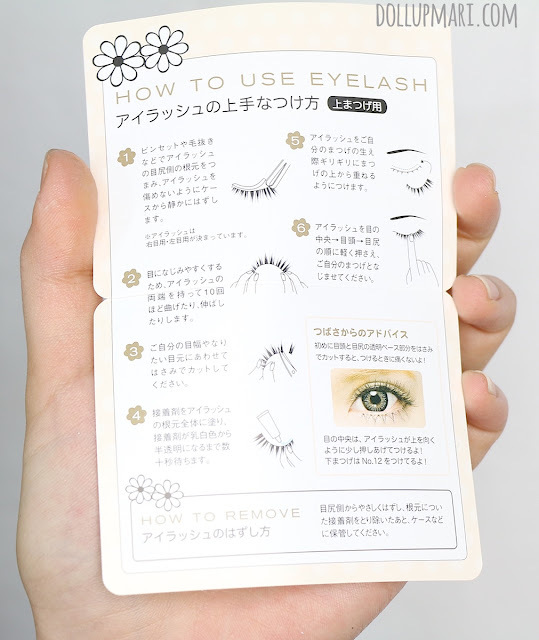 They even provided an eyelash usage guide! And this product also came with a small tube of eyelash glue. I'm now bringing up this image again because I did things differently. One of the elements of gyaru makeup is to have long false eyelashes that they go beyond the lashline and reach beyond the corners of the eyes. 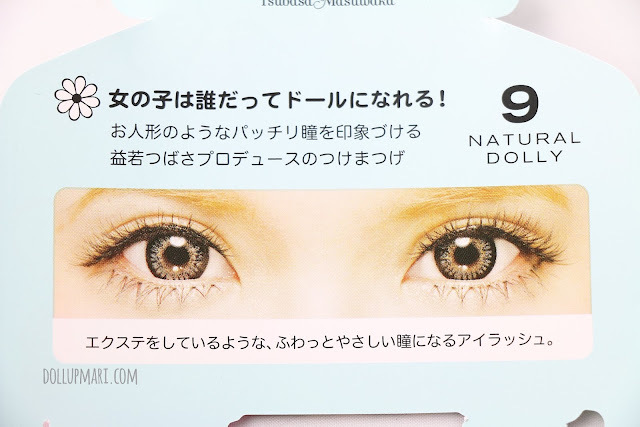 For the gyaru look, there is an expectation to use lashes the way they come from the package to give a dolly and droopy eyed kind of look. It takes a lot of getting used to, and I feel itchy immediately whenever my false eyelash pokes at my eye's corner, which is why I trim the lashes. This is the actual case where the false eyelashes are. 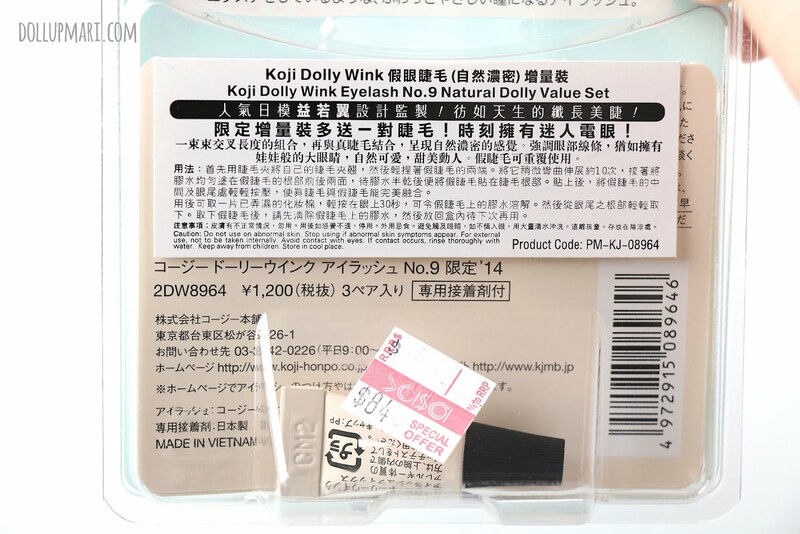 The other very unique thing about Dolly Wink false eyelashes is that they have transparent strips. If I'm not mistaken, they're the first brand to make eyelashes with transparent strips that other brands just had to follow. This feature now enables people to really have the no makeup look because it really will just contribute to the lashes. Eyelashes with black strips sometimes end up looking like poorly applied eyeliner when there's no eyeliner on the eye, which is why this is such a unique and industry disrupting feature. The detail on these eyelashes is amazing. Photos cannot capture the precision on where the hairs are placed, how the fibers look and feel, and how intricately made these are. And now it's application time! I am the kind of person who slathers on a lot of glue on the eyelash, because, well, there's no such thing as applying too much glue on your false lashes. I position how I'll apply it. But beforehand, I've already fitted the lashes. As in I took them, put them on my lashline, and made trimmings based on my lashline's width so that it'd just sit exactly on my lashline. This glue I used is their glue, and it dries up soooooo slowly. 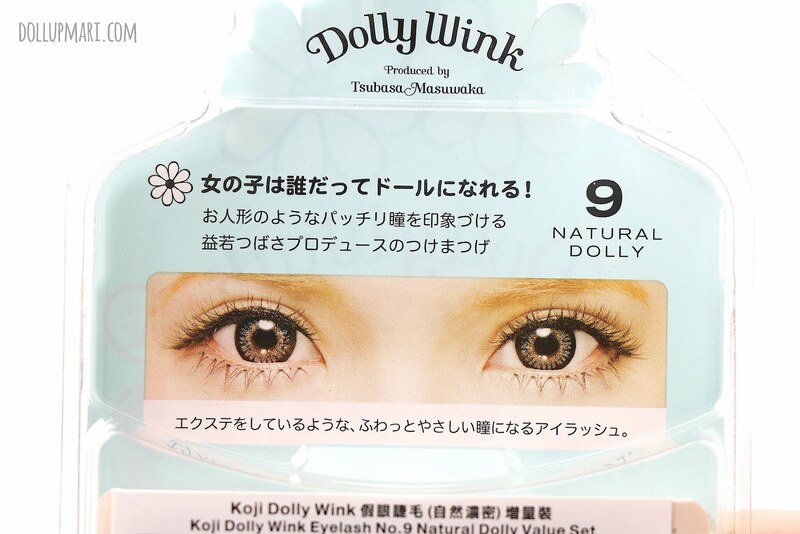 I honestly do not understand why because Dolly Wink is made my Koji, the makers of Spring Heart and Eye Talk. A lot of times when I use Eye Talk for my false lashes, like I haven't even settled applying the lashes onto my lashline, the product has already dried. And to even think that Koji comes up with the best eyelash adhesives hahahaha. But since it's there already, I just stay patient and wait for it to dry. And for the spots that just won't dry, I apply eyeliner so that it'd disappear, color-wise, on my lashline. But the effect after the lash is settled in is phenomenal. It really brings life to the eyes, and the effect is just so glamorous yet natural. 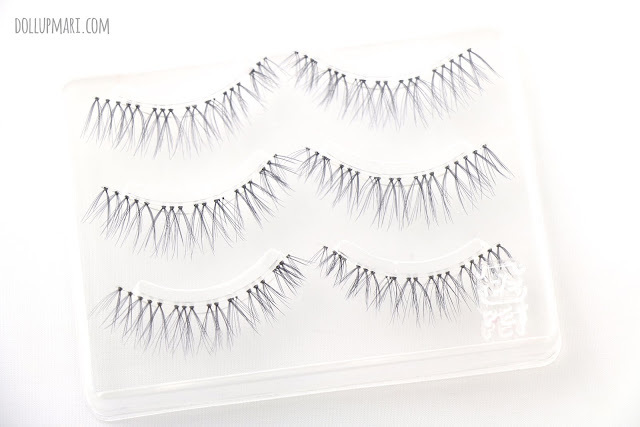 This has been one of my favorite go-to lashes for special occasions because they just look so nice on the eyes. If you want to get your fix of Dolly Wink products, fear not because they have a local distributor! find them on Facebook here. Wow! I wanna be a doll too! Pak na pak yan together with Contact Lens! No need na para mag liquid eyeliner! I have done eyelash extensions before and it does not lasts long. May i ask if human hair ba siya Ms. Mari? What do you mean by "at least these lashes aren't made in China?"